If you grew up in a Christian home like I did, bible stories were likely a big part of your life. Even in the secular world— at least in certain areas— some Bible stories are pretty well known. David and Goliath, Noah’s Ark, Jesus’ birth, etc. But there are many, many Bible stories that get the short end of the deal and you when you come across them in your Bible reading, you might just skim over them and forget. Today, I bring you the rather crazy story of Balaam, most known for his talking donkey and not much else. Who is Balaam? The short, straightforward answer is that he’s a prophet. More interestingly, he is mentioned not once, not twice, but three times in the New Testament. And not in a nice way. Right off the bat, it seems God has something he wants to teach us through Balaam. But that’s not the end of the story of Balaam. No, not at all. In fact, the story of Balaam as found in Numbers 22-24 is really something else. Something totally unexpected coming from this rather evil prophet and something that we can learn a lot from. Something that has very little to do with Balaam and a whole lot to do with God. This was the concern of the Moabites and their king, King Balak when the Israelites flooded into the fields of Moab and set up camp as part of their 40 years of wandering. What do you do when you're afraid of being wiped-- or licked, I guess-- off the face of the earth in 1400 B.C.? Call your friendly neighborhood prophet, of course! (With some honorable princes and good money to sweeten the deal.) And here we have Balaam, being asked to curse Israel. You might think that-- given his reputation in the New Testament and Balak's offering of money-- Balaam would have jumped at the task. Instead, he decides to contact God to see if it was okay. Weird. It's not okay, of course. Israel is God's people. But Balak just won't take no for an answer. Double the princes with double the honor, promise Balaam more respect, promise to be at his beck and call and ask again. Balaam is still oddly resistant. Of course, right after that he says that he'll ask the Lord again, despite having just asked him. This time, however; God says he can go as long as he obeys him; but if you think it's because God is perfectly okay with this, think again. No, God is mad (22: 22) and the very next thing God does is send an angel with a drawn sword after him to kill him. Oof. Clearly, Balaam is not asking as innocently as he pretends. If it's any part of the story you remember, it's this next part. You know, the talking donkey part. Balaam's donkey sees the angel and turns away three times, Balaam beats his donkey each time, and then the donkey suddenly confronts Balaam and Balaam acts like nothing is out of the ordinary (as far as we can tell). It's kinda hard to miss. "... the Lord opened the mouth of the donkey and she said to Balaam... 'Am I not your donkey, on which you have ridden all your life long to this day? Is it my habit to treat you this way?'" But looking back on this part of the story, it's not the talking part that I find the most interesting, it's the donkey. What are donkeys most known for? Stubbornness. Disobedience. Self-interest. "Be not like a horse or a mule, without understanding, which must be curbed with bit and bridle, or it will not stay near you." Granted, mules are only half donkey, but still. Things are not in favor of the donkey here. This is why I find it so interesting that God chooses a donkey of all animals to obey him. 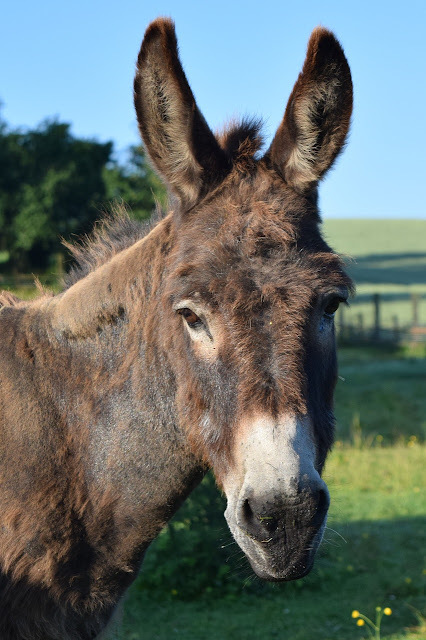 A donkey. Not the prophet. Not the guy who's claiming he won't go beyond God's command. It's the donkey that sees the angel, it's the donkey that turns away. Balaam needs a donkey to open his eyes. Yes, God allowed Balaam to go, but judging from God's actions Balaam didn't truly want to do God's will. Regardless of what exactly he was thinking, God has something he wants Balaam to understand-- something so important he will kill him if he doesn't get it straight. Only say the word God tells you. Like I said in the beginning, this story is not really a story about Balaam. We don't really know what's going on in Balaam's head. All we know about him is that he was ultimately an enemy to God and Israel. No, this story is about God working through a wicked prophet to show his faithfulness and protection over his people despite all odds. In the end, Balaam follows God's commands instead of Balak's and-- not once, not twice, not even three times, but four times-- blesses Israel and finishes off by cursing the very nation that sent him. The more Balak begged for Balaam to curse them, the more blessings God piled on them. How ironic. But the best irony is that the very prophet who is speaking these blessings is the prophet who causes so much trouble for Israel in his lifetime. His own words show that he too will not prevail. So often we can feel overwhelmed by struggles and pressures, whether from our daily life or from a society that more and more hates God and what he stands for. We can wonder about the Balaams of our time-- the people that stumble the church and love to gain from evil-- and how they often seem to get away with so much. But here God reminds us that even though we can't always see how he is working, he is working. His promises stand and he will fulfill them, no matter how much his enemies try to thwart him. I strongly suggest reading all the rest of the blessing Balaam gives Israel on your own time. You can find them scattered throughout Numbers 23-24 and-- plug time!-- if you would like to listen to a musical version, my great-uncle Jamie Soles beautifully compiled the first two sections of these promises together almost word for word in his song Dust of Jacob. I highly recommend it (and the rest of his music).